MatherFamilyLibrary is a Legacy Library. Legacy libraries are the personal libraries of famous readers, entered by LibraryThing members from the Legacy Libraries group. » Mather Family Library's catalog. » Mather Family Library's legacy profile. MatherFamilyLibrary is also an author. About meThe known portion of the large, multi-generational library created by the Mather Family of early Boston (and beyond). Samuel Mather (1626-1671), Richard's eldest son, graduated at Harvard in 1643 and was made minister of Boston's North Church in 1650. Soon after, he removed to Ireland, where he preached at Dublin until 1660 and again from 1662 until his death. Nathaniel Mather (1630-1697), the second minister son of Richard, graduated at Harvard College in 1647 and soon went to England. He later preached at Rotterdam and Dublin, before returning to London, where he died. Eleazar Mather (1637-1669), the third minister son of Richard, graduated at Harvard College in 1656, and was ordained minister of Northampton in 1661, where he served until his death. Mather Byles (1707-1788) was the son of Increase Mather's daughter Elizabeth Mather and Josias Byles. He was pastor of the Hollis Street Church (Boston) from 1733 until 1776, when he was placed under house arrest for his loyalism. He remained in Boston until his death. 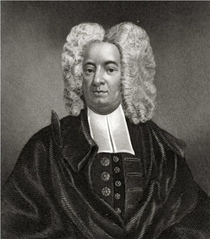 Samuel Mather (1706-1785), son of Cotton, graduated at Harvard College in 1723 and preached in Boston (first with Rev. Joshua Gee at the Old North Church, and from 1741 until his death at the meeting-house on the corner of Hanover and North Bennett Streets in Boston's North End). A basic "family tree" of the Mathers showing the disposition of the library can be found here. About my libraryThis library originated around 1610 with the books of Richard Mather (1596-1669), the first Mather to arrive in America (in 1635). Richard's library was willed to his sons, with two-fifths going to Samuel and one-fifth of the collection going to Nathaniel, Eleazar, and Increase (select titles went to other family members). Samuel's two-fifths of his father's library were willed to his nephew Samuel Mather of Windsor (CT) (1651-1728) (son of Timothy Mather); in fact, it is possible that the books from Richard's collection remained in New England when Samuel returned to Britain. The ultimate disposition of this portion of the library is unknown; it is believed to have passed to Samuel's sons Azariah and Nathaniel. Many of Nathaniel's books, presumably including at least some of the one-fifth of Richard's collection he received, passed to his nephew Samuel Mather of Witney, England (son of Increase). Nothing more is known of these titles. The portion of Richard's library willed to his son Eleazar is believed to have passed into the hands of Eleazar's son Warham (1666-1745), whose book catalogue at the time of his death ran to twelve folio pages. This library passed to the children of his sister Eunice Williams, and its further disposition is unknown. Increase Mather's library was outlined in a handwritten list begun by him around 1664 (the original is now held by the Boston Public Library). Many of the books were spared by the fire which destroyed Increase's house in 1676; some of those lost were replaced by titles from the library of Dr. Leonard Hoar, recently deceased (given to Mather by his widow). Mather also bought books in London during his 1688-1691 visit there. Increase's books were divided up at his death, with one-half going to his son Cotton, one-fourth to his son Samuel of Witney, England, and one-fourth to his grandson Mather Byles (son of his daughter Elizabeth). Nothing is known of those titles given to Samuel of Witney. Cotton Mather wrote in his diary on 28 October 1683 that he had "A Library exceeding any man's, in all this Land." A portion of this library (some 97 titles) had been purchased from Harvard College in 1682 (as library duplicates). By the time he added volumes from the estate of Dr. Charles Chauncey in 1700, he already had between two and three thousand volumes. In 1706, he noted "Seldome any new Book of Consequence finds the way from beyond-Sea, to these parts of America, but I bestow the Perusal upon it." In 1724, he called the library "the darling of my little enjoyments." The disposition of Cotton Mather's library, Tuttle writes, "is surrounded with some mystery." We know that the library was saved by Cotton's son Samuel, but the process by which this occurred is unclear. Mather Byles' library was nearly destroyed by a fire in 1787, but, being in imminent danger, "his hoards of books, instruments, papers, prints, &c., &c., were dislodged in an hour from fifty years' quietness to an helter-skelter heap in an adjoining pasture." At his death, Byles' library contained 232 volumes in folio, 180 in quarto, 2394 in octavo, and 24 smaller books. It was sold at auction in November 1790, with some of the books eventually making their way to the Massachusetts Historical Society through Thomas Wallcut. Some portion of Mather Byles' library remained in the possession of his heirs: his daughters Mary and Catherine, and after them more distant relations. The library of Cotton's son Samuel was intact at the time of his death in 1785 (although Abigail Adams wrote to John that she believed it had been destroyed by the British bombardment of Charlestown in 1775). Samuel's son (another Samuel) later wrote that his father's library consisted of "7000 or 8000 Volumes of the most curious and chosen Authors ...". In his will, Samuel decreed that the library should be given to any descendant "inclined to the Ministry and settled in it." Exceptions were the French books, which were to be given to his son, and any books desired by his daughters. The daughters were Elizabeth (who died in 1788) and Hannah, who married Joseph Crocker. Hannah Mather Crocker and other executors of Samuel's estate gave a portion of the Mather Library to the Massachusetts Historical Society in 1794. Another portion of the Mather Libraries were given to the American Antiquarian Society as "the remains of the Library of the Mathers" in 1814. Some of these were donated by Hannah Mather Crocker; others were purchased by Isaiah Thomas and donated by him. Other scattered volumes were received by the AAS in 1831 and 1834 (with the library of Thomas Wallcut, some of whose books also went to the Massachusetts Historical Society). The largest portion of the Mather Libraries held by Hannah Mather Crocker was not donated, but was dispersed by her privately. The famed American book collector George Brinley acquired at least a few of these copies, which were dispersed at the sale of the first part of his library in 1879. This catalogue includes those titles from the Mather Libraries known to be held by the Massachusetts Historical Society, the American Antiquarian Society, and other institutions. It also includes those sold at the Brinley sale and others which are known. A complete introduction to the Mather Libraries (from which all of the above is derived) can be found here, in Julius Herbert Tuttle's 1910 bibliography, The Libraries of the Mathers. Tuttle's work is updated here by noting new locations and additional information where possible. The "Comments" field for each title includes any extra-bibliographical information available (signatures, annotations, current location, &c.).